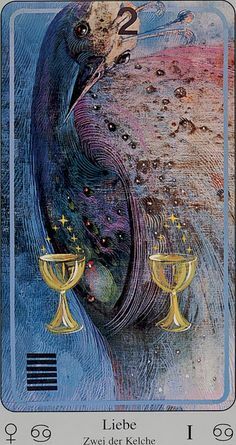 Venus enters Cancer today, and the Tarot card associated with it is the Two of Cups. Almost everyone likes to see this card (when it's upright, at least). It's difficult to get a negative reading on it. It indicates the equal exchange of emotion. What you feel for them, they feel for you. It doesn't promise a love that will last forever, but it's a very nice start to a new romance, or an excellent indicator of ongoing love in an existing relationship. Mind you, the surrounding cards can modify its meaning, but by itself it suggests love/affection that is reciprocated. I wrote about the Two of Cups in this post as well, explaining how (depending on the context of the reading) it's not always about love. If you're asking about an issue that does not involve romance, this card indicates that someone else will be receptive to what you want, or what you're offering. Also, cooperation and the open exchange of emotions will be important. If this card is reversed, it can indicate unrequited love, or someone else is not receptive to what you're offering. This card reminds us that for Venus in Cancer to flourish, nurturing must be returned. Co-dependency, nurturing that is accepted but not reciprocated, or nurturing that is refused, is the surest way to bring out the Shadow in this planet/sign combo. Card pictured is from the Haindl Tarot by Rachel Pollack.